This entry was posted on Tuesday, October 21st, 2008 at 9:27 pm	and is filed under Fresh Spanish, Main Dishes, Spanish. You can follow any responses to this entry through the RSS 2.0 feed. You can leave a response, or trackback from your own site. Another lovely meal. Great picture. What a gorgeous stew :)! I’ve been making quite a bit of stews lately, but I haven’t thought of using fish; great idea! I would love to include your recipe in our pre-loaded Demy, the first and only digital recipe reader. Please email sophiekiblogger@gmail.com if you’re interested. 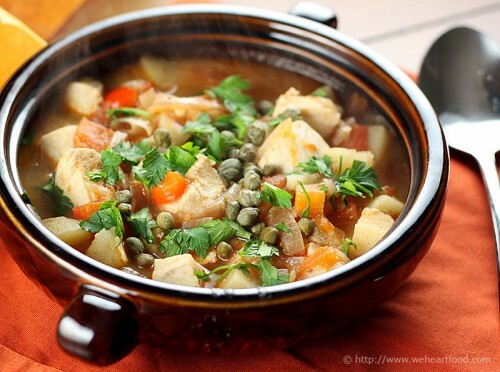 wow, this looks like a great stew – now I know how else to cook the mahi mahi that my hubby catches! thanks ! Blimey, I am a fellow Seattle blogger, and don’t think I have come across your blog before! How the heck did that happen..
A great looking soup I have to say. How is that Fresh Spanish book? I am looking at getting into modern Spanish food more next year. Matt — Considering we got it in the Bargain Books section @ Barnes & Noble for $7.98, it’s pretty good. We’ve only made a couple recipes from it so far, but looks promising. Yes, this has all of the wonderful Basque flavors. I’m bookmarking! That is a fantastic photo! And the recipe sounds delicious. This was great! I was in a rush so I used canned tomatoes and jarred roasted red peppers. I used regular and sweet potatoes. I would definitely make this again.